This entry was posted in news special editions and tagged MINI Clubman on January 26, 2011 by James Day. Our German partner site bigblogg.motoring has exclusive photos of the forthcoming MINI Clubman 50 Hampton Edition. The “50” this time refers to the 50th anniversary since the introduction of the Austin Countryman and Morris Mini Traveller. 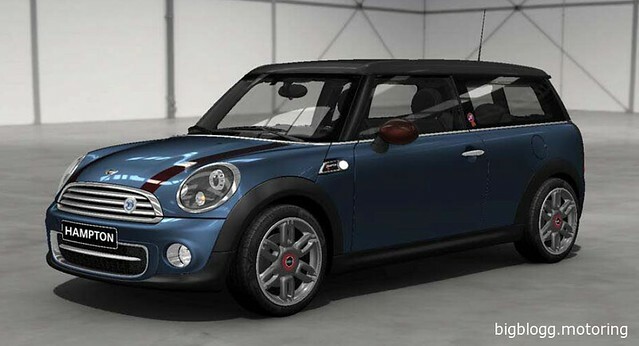 The MINI Clubman 50 Hampton Edition will be available in current colors Eclipse Grey, Midnight Black, and Pepper White but also in a new color, Reef Blue Metallic, shown above. Exterior details include mirror caps and bonnet stripes in a dark red called Damson Red, special side scuttles, MINI 50 grille badge, and wheel center caps on the 17″ Twin-Spoke Alloy wheels. See more photos from bigblogg.motoring at Exklusiv: Der MINI Clubman 50 Hampton (English translated version).